Ben is whipping up breakfast for Susan Richards and her son Franklin when Starhawk beams onto their breakfast table. It seems that Vance Astro has gone down to earth with the intent of meeting his younger self, and Starhawk fears that this will create a time disaster. He's come to Ben and the FF for help, and then almost immediately departs to go contact the Avengers. Meanwhile, Ben and the Fantastic Four have detected a mysterious fog bank coming from upstate, and a mysterious energy source as well. They quickly head up to investigate, and while the others stay outside the creepy dark fog, Ben and Mr. Fantastic head in. No Clobberin' Time in this issue. Page 1, panel 1. Ben is cooking breakfast for Sue and Franklin. "Well, Suzie, I wanted to try out my Aunt Petunia's recipe for pancakes!" Ben and the Guardians of the Galaxy had previously met up in MTIO issue 5, in the far future. In the present, Ben had met Starhawk in MTIO issues 61-63. 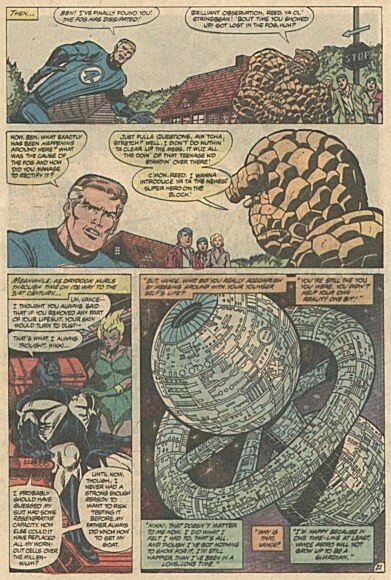 This is the last appearance of the Guardians of the Galaxy in their current trip to this time- they return to the 30th century after this. For those completely unfamiliar with the Guardians- in their alternate future, Vance Astrovik grows up to be an astronaut, and travels in suspended animation to Alpha Centauri. During that time, humanity develops faster-than-light travel, and Vance wakes in the 30th century, with all his friends and family from the past now centuries dead and buried, to the realization that his trip was done for no useful reason. When humanity is attacked by the Badoon, he becomes a founding member of the Guardians of the Galaxy. They are in our time in this issue as they had travelled back in time to deal with the threat of Korvac. That accomplished (in Avengers 167-177), they return to the 30th century at the end of this issue. Someone else's review of this issue can be found at http://www.geocities.com/Area51/Dimension/5210/com_to69.html. 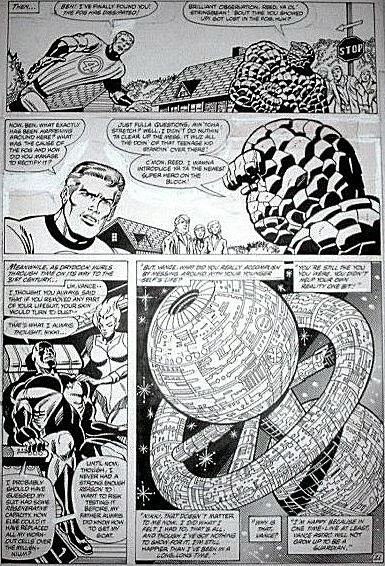 Yet another review of this issue can be found at http://www.samruby.com/OtherTitles/FantasticFour/marveltwoinone069.htm. --- Original art, from your editor's personal collection, such as it is. I've framed this as a three-part piece with the original art, the original colorists art, and the page as it appeared in the issue. 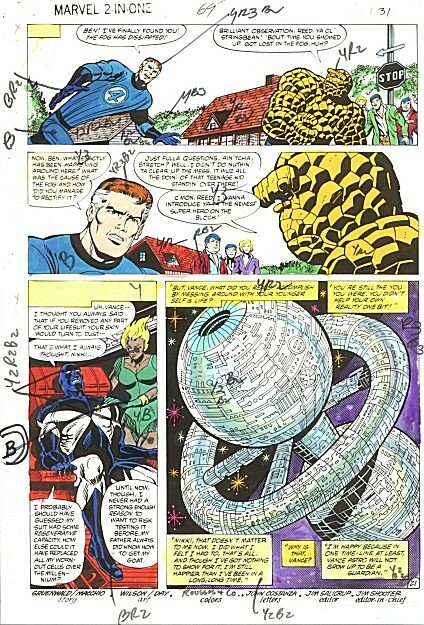 This is the final page in this issue. The really odd thing about the three pages- if you look at the bottom of the colorist's page, you'll see credits for the issue there. These appear on neither the original nor the final printed page. There is a little surface tearing on the bottom of the original, which may be where they were pasted on before later being removed. Credits in that issue ultimately appeared on the first page.